30 Nov 17 - Unusually for a large UN climate conference, the recent Bonn talks didn’t finish with any late-night haggling. Progress, in the form of various commitments and pledges, is best described as slow and steady. 24 Nov 17 - If anything came out of the COP23 climate conference in Bonn, it’s a poison pill for Poland. 20 Nov 17 - The climate talks in Bonn saw little drama other than some star turns and a pantomime villain. All eyes are now on Poland, the next summit host. 17 Nov 17 - New Zealand has just committed itself on the world stage to being carbon-neutral by 2050 and being a Pacific leader on climate change. 17 Nov 17 - New Zealand has signed up to a plan to cut methane and black carbon emissions from agriculture and waste. 17 Nov 17 - New Zealand is part of a new alliance launched at the Bonn climate talks that hopes to signal the end of coal. 17 Nov 17 - Carbon markets have become a vital piece of common ground for defenders of the climate. The tool is gradually extending around the world, bringing with it higher revenues. 14 Nov 17 - The world has been given a stark warning by some of its leading scientists: there is much worse climate change on the way. 14 Nov 17 - The United Nations should give a “seat at the table” to a powerful group of US states, cities, tribes and businesses that are committed to taking action on climate change, Michael Bloomberg has urged. 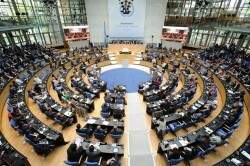 14 Nov 17 - Just over 19,000 delegates and officials are attending the UN climate talks in Bonn. The largest party - 493 - comes from the Cote d'Ivoire. 10 Nov 17 - Changes to the Emissions Trading Scheme have won New Zealand a Carbon Pricing Champion Award at international climate negotiations in Bonn. 9 Nov 17 - Fonterra will strut its stuff tomorrow at international climate talks in Bonn. 9 Nov 17 - African campaigners have called for US negotiators to be barred from climate talks under way in Bonn. 8 Nov 17 - Carbon markets need to do things differently to avoid the mistakes of the Kyoto Protocol, a market watchdog says. 7 Nov 17 - New Zealand will be represented at international climate negotiations by climate minister James Shaw and Pacific minister Aupito William Sio.